2.4GHz wireless technology can provide reliable connection within 360 degree and 30 meters without any interference. A new generation of low-power technology,five times more than ordinary wireless power,battery life of to 20 months,eliminating the trouble of frequents replacement batteries. Return rate shows the speed transferring data between the mouse and computer.250Hz return rate allows wireless mouse have to delay nor jump frame in fierce games.It has more practical significance for competitive gamers. High precision game 1000-1600-2400 PI switch,to ensure taht the game process quickly locate the object. Silent micro-pres.Click sound is reduced about 95% than other mouse,truly realizing no interference in the same room with first-class keys.It has a service life of up to 300 million times. PLEASE NOTE: before using this mouse, please prepare 2 AAA batteries for power yourself. They are not included. 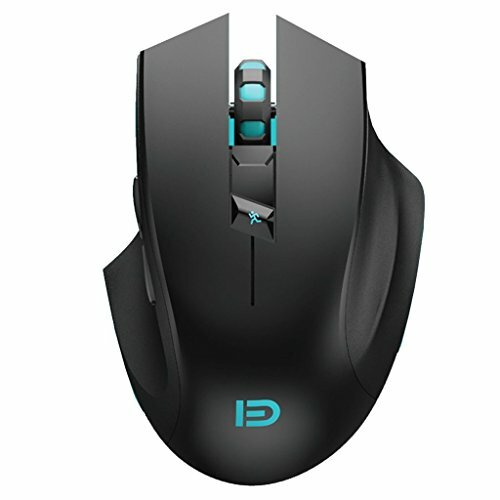 Whether you are aiming, targeting, slashing or attacking, a professional computer gaming mouse is your best weapon! Discover the most responsive and comfortable Pro Wireless Gaming Mouse! The ideal pc accessory that will skyrocket your performance!The advanced 2.4Ghz wireless technology enables working distance up to 30m with little-to-no delay or signal drops. Power-saving Design Gaming Mouse: Provides up to 20 months of battery life without sacrificing any gaming-grade capabilities. Five times power saving than ordinary wireless computer mouse. The LED battery indicator warns you if the charge is running low. 2.4GHz Wireless Gaming Mice for Mac: Put in 2 AAA aikaline batteries into the computer mouse (please note the 2 AAA batteries are not included)and enjoy the 2.4(GHz) wireless technology, which delivers a reliable connection with up to 30 (approx 98ft) meters, experience safer and more accurate than traditional FM radio system. Comfort&Precision at you fingertips!-Computer Wireless Gaming Mouse is an essential computer accessory for die-hard gamers! You will be amazed by the unmatched comfort, lethal accuracy and killer precision of our durable, desktop and laptop pro gaming mouse! Great Compatibility: This Computer Mouse Can Work on USB 3.1, 3.0, 2.0 or less version port or Win10, Win8, Win7, XP(x64)/ Vita/ 7/ 8 Mac OS X/Linux etc. (More than V10.4). This Computer Mouse Can Compatible with PC, Laptop, Mac, Notebook. If you have any questions about this product by FOME, contact us by completing and submitting the form below. If you are looking for a specif part number, please include it with your message.